I was able to use QODBC Online. 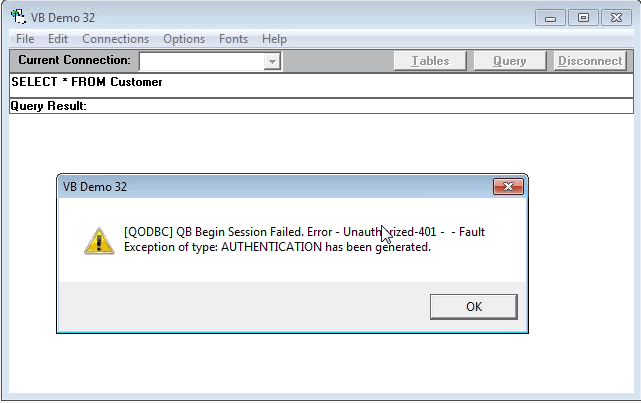 Suddenly, I am getting below error when I tried to connect QBO using QODBC Online. It was working properly. No known changes to Windows or QODBC. Begin Session Failed. S0000 00000 [QODBC] QB Begin Session Failed. Error - Unauthorized-401 - - Fault Exception of type: AUTHENTICATION has been generated. Authorized access token for QuickBooks Online will remain active for 180 days. An authorized access token expires after 180 days. When this occurs, responses to calls to QuickBooks Data Services and the QuickBooks Online API indicate that the access token is invalid. So, You need to reauthorize/reconnect QODBC Online at QuickBooks Online to resolve the issue.